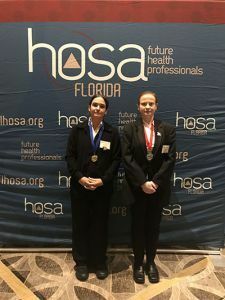 Three Pensacola State College students won big at the Florida HOSA State Leadership Conference held April 5-8 at the Gaylord Palms Resort and Convention Center in Kissimmee. In the veterinary science competition, Katherine Gaskill won first place while Christina Zaccardi won second place. In the medical math competition, Ashlee Johnson placed fifth. First- and second-place winners qualify to attend the 2018 HOSA National Leadership Conference set for June 27-30 in Dallas. Pensacola State’s veterinary science students also placed in the top brackets scoring higher than students from the University of Florida and University of South Florida.